At 7am on Tuesday, Rachel, Ashley, and I made our way through the dusty streets of San Pedro. Dawn was breaking, and the outline of the Andes was visible. Just hours earlier, we had gazed at of the world’s starriest night skies. With extremely low humidity and cloud cover, Chile’s Atacama desert is a paradise for astronomers. 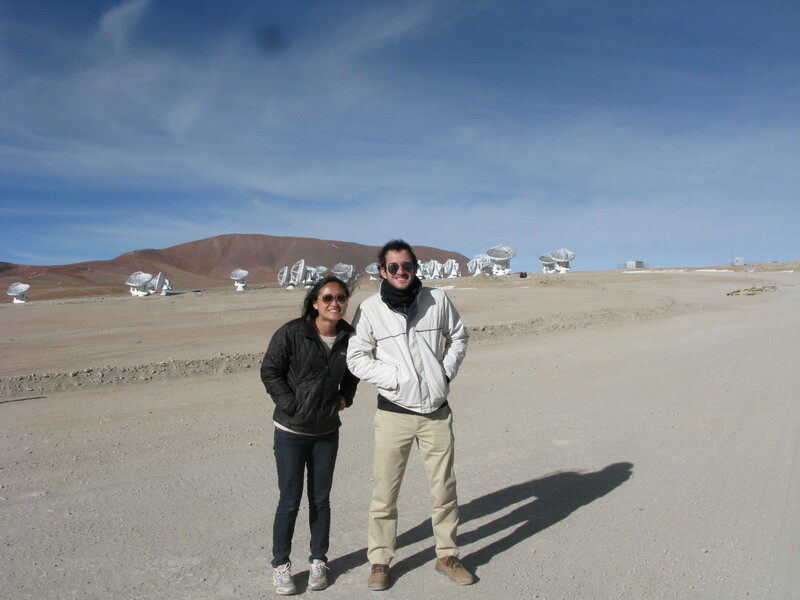 And so we drove towards the Atacama Large Millimeter Array (ALMA) the world’s most ambitious astronomical project. 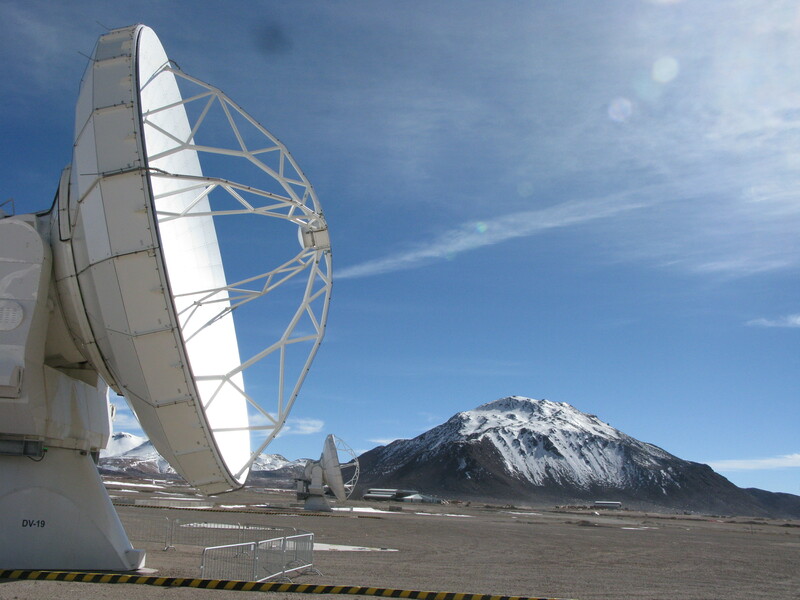 ALMA conveniently spells “soul” in Spanish, and the project will peer into the depths of space. 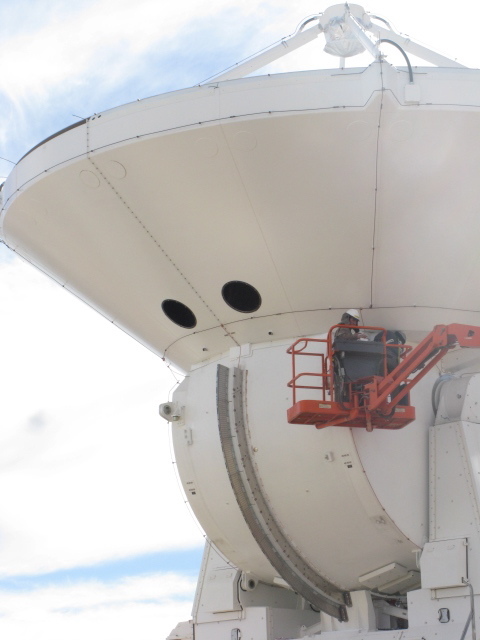 Under construction, and with some US$1.5 billion invested, it already boasts 32 massive antennae. It will have over 60 when completed in 2014. ALMA will detect an unprecedented range of electromagnetic radiation to “see” even the earliest galaxies, and explore nothing less than the origin of the universe. After passing the first checkpoint – and being granted special passes – we went up to the Operations Support Facility (OSF), the ALMA base camp, at 3,000m above sea level. To go up further, we needed to pass a medical examination. 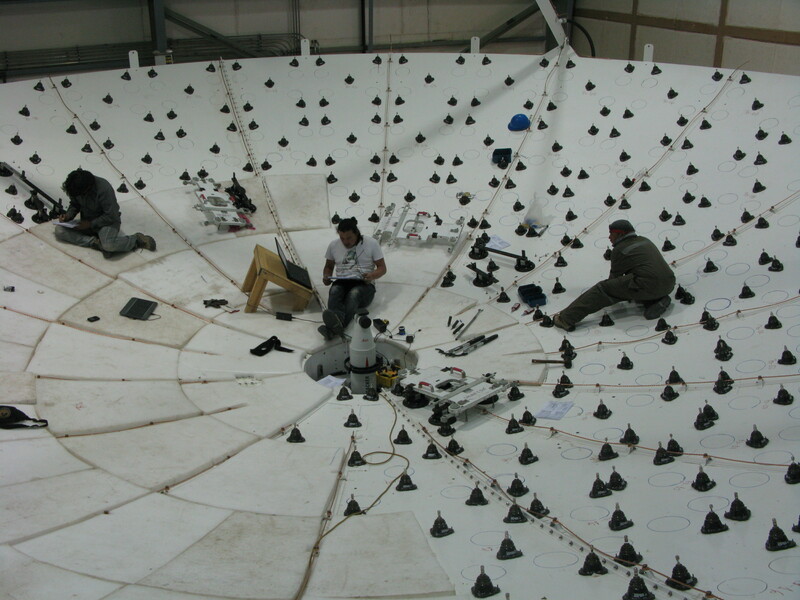 The array is located at over 5,000m, on the vast Chajnantor plain, deep in the Andes. At such altitudes, breathing becomes difficult, and health problems can arise. As fit 18 and 21 year olds, we easily passed the test. But just to be sure, the OSF safety officers gave us emergency oxygen tubes. So we went up. The air thinned. Ashley fell asleep, and I felt a bit woozy myself. Vegetation disappeared. We saw snow. And after 40 minutes, the antennae appeared. The massive white antennae contrasted with the red desert and the snow-capped mountains. A Star Wars song immediately popped into my head. Driving into the heart of the array, we got out for photos. I felt sleepy, and had to take deep breaths. It was freezing, -2˚C, or less than 30˚F. The wind chill made it worse. But it was awe-inspiring, and I can’t do justice to the sight in words! We returned to the base camp for lunch and an interview with Kertik Sheth, an astronomer. I half-expected space food, but lunch was normal. Over coffee, Kertik explained some physics concepts. This was a feat of explanation, since we knew nothing about astronomy. When we gasped at the first equation Kertik drew, he explained it all in layman terms: In brief, the dozens of dishes coordinate their observations and function like one huge dish, which captures a broader electromagnetic spectrum. To add up the thousands of observations per millisecond, ALMA is also building one of the world’s fastest super-computers. Kertik told us a bit about life at ALMA. 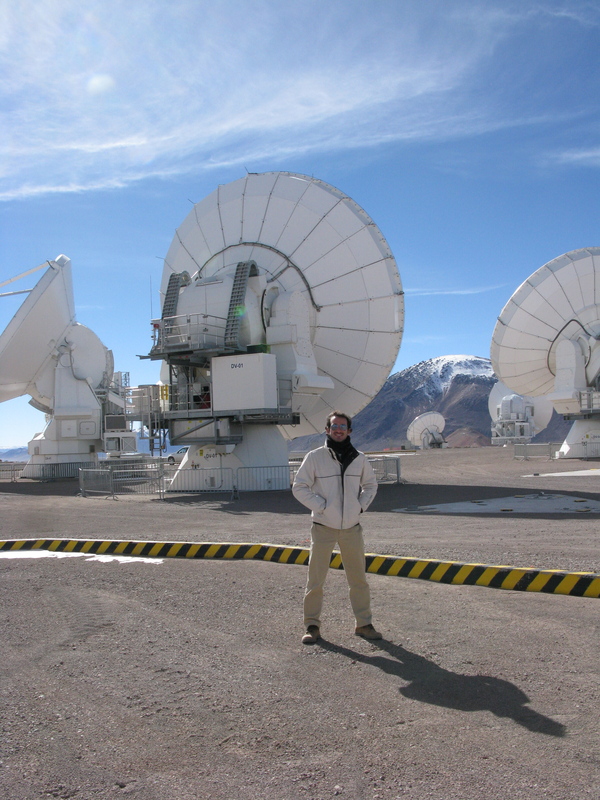 Engineers and astronomers work for 8-day shifts (working every day from 6am to 11pm), get 6 days of rest in Antofagasta or Santiago, and work for 8 more days. Some then return to their home countries for a few months. All in all, the camp lodges over 600 workers, scientists, and engineers from over 20 countries. We saw Kertik’s living quarters – a sparse, college-like dorm, with black shutters to sleep after nighttime observations. The hundreds of temporary construction workers stay in temporary cabins, but can take a bus to San Pedro for evenings in town. At 4pm, time came for us to head back. Star struck by the project (excuse the pun), we said goodbye to our hosts, and glimpsed at the white antennae for one last time. They disappeared behind the red mountains, as we drove through the dry desert road towards San Pedro.